Anyone who needs proof of Adam Brazier’s inventiveness as a director need only see his production of Marry Me a Little now playing at the Tarragon Theatre. The show from 1980 was constructed by Craig Lucas and Norman René from songs that Stephen Sondheim had cut from his various musicals or from musicals that never made it to the stage. A recital of rejected Sondheim songs unconnected by dialogue hardly sounds appealing, but Brazier finds the drama and humour in the material to transform this series of songs into a charming if slight mini-musical. Brazier’s approach completely overturns the way this musical is usually presented. 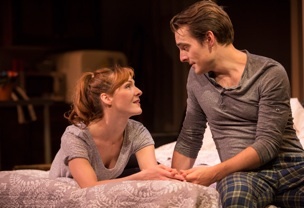 He and She live alone in studio apartments, one above the other but represented on stage by a single apartment in which the two characters move about without ever interacting with each other. Should they happen to sing a duet, it is accidental and irony only emphasizes their loneliness. Brazier begins with this scheme on Ken Macdonald’s highly detailed set for the first two of the nineteen numbers – “If You Can Find Me, I’m Here” and “Saturday Night”. Brazier has Adrian Marchuk as He and Elodie Gillett as She cleverly move all about the set without ever acknowledging each other’s presence. The stage business he gives Marchuk suggests that He is changing the decoration of his apartment to a style he likes. He changes the lampshade on a lamp, pictures hanging on the wall and replaces the piano bench at his piano with a worn-out desk chair. Because Brazier has Marchuk play the first chords of several of the songs, including the first, while making notations, we conclude that He is a songwriter. Brazier ingeniously has Marchuk pass the accompanying duties to music director Paul Sportelli, at another electric piano, hidden behind the semi-opaque windows of the flat. After a lighting cue from designer Gareth Crew alters the mood from gloomy to bright, Marchuk begins the first chords of “Can That Boy Foxtrot” whereupon Gillett re-enters show clad in showgirl attire. This time the two acknowledge each other and it is clear that He is the accompanist for She and the song ends in a spotlight on them both. After another razzle-dazzler, “Bring On The Girls”, comes the song “Once Upon A Time”, where we see that She is moving in with He. As She surveys her surroundings She undoes al the changes that He has done in the first song. We thus realize that “Can That Boy Foxtrot” began a flashback to how the two first met and that the show is now examining the relationship between the two as it moves forward in time to their breakup and the separate lives we first glimpsed. Thus rather than giving us a 75-minute-long portrait of two lonely people and the love lives they imagine, Brazier gives us the dynamics of a relationship to follow. This is brilliant idea and much more engaging. To achieve it Brazier does have to alter the usual order of the songs, omit some and substitute others. The first song is usually “Saturday Night” from the unproduced 1955 musical of the same name. Brazier inserts the melancholy “If You Can Find Me, I’m Here” from Evening Primrose (1966) before it. The final song is usually “Little White House”, a vision of marriage. Brazier pairs this with “Who Could Be Blue” instead and ends with “It Wasn’t Meant To Happen” from Follies (1971), a more suitable comment on the breakup of the relationship he created between He and She. request for a the stamp of commitment on their relationship, He sings “Happily Ever After”, also from Company, that contrary to its title depicts the bonds of married life as “hell”. In the second last song “Rainbows”, from an unproduced film of Into the Woods, She points out the distinction between them. She is always looking for rainbows. He is always looking for the rain. Gillett and Marchuk make a great pair. They both have strong personalities and they both have similar vocal characteristics. Gillet shines in all her songs but it is a special treat to see her finally let go in such songs as “Can That Boy Foxtrot”, something her roles at the Shaw Festival have never provided. As an actor one need only watch her face as Marchuk sings “Happily Ever After” to see how gradually her smile at the hope of marriage turns to stony humiliation. Marchuk is especially good at the more contemplative songs. He also expertly brings off the comic touches he gives his character as when He extends his vowels taking out hot Chinese food from a bag or warning She not to throw out his old slippers. No one will claim that this is a great Sondheim musical. While many songs are witty like “Uptown Downtown” or delicate like the title song, there are others that Sondheim was right to reject. “Bang!” and “Silly People”, luckily were both cut from A Little Night Music (1973), and really are no better here. Nevertheless, Brazier’s brilliant reconception of the musical, while not betraying the songs’ bittersweet atmosphere, will likely make it much more engaging for most people and will likely be imitated by others. Photos: (from top) Elodie Gillett and Adrian Marchuk; Elodie Gillett and Adrian Marchuk. ©2014 Cylla von Tiedemann.